- There are 6 brand of car (Laborghini, Ferrari, Mercedes-Benz, BMW, Lexus and Toyota) and 2 colour (red and green) total 12 bet options. 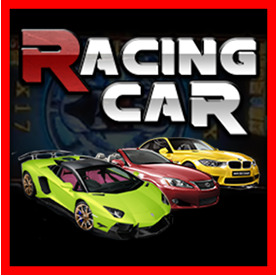 -Player may bet the brand car with the colour you like in Racing Car . Wheel feature in Racing Car :Wheel feature will appear when the light stop on the flag symbols. The light of wheel feature will randomly stop and win multiplier bonus, extra bonus, brand win bonus, green win bonus, red win bonus and all win bonus. Brand win bonus in Racing car :When you win brand win on wheel feature, all the color as this brand will consider to win. Multiplier bonus in Racing Car :When you win multiplier on wheel feature, another wheel will appear and bring you 2, 3, 4, 5 multiplier win. Extra wins bonus in Racing Car :When you win extra win on wheel feature, another wheel will appear and free you 2-9 win symbol. Color bonus in Racing Car :When you win red win or green win on wheel feature, any brand as long as this color are considered to win. All win bonus in Racing Car :When you win all win on wheel feature, all symbols are considered win.